Attorney and representative of the Black Lawyers Association at the National Forum on the Legal Profession (NF), Kathleen Matolo-Dlepu, gave an update on the NF. The Black Lawyers Association (BLA) held its elective conference and annual general meeting (AGM) on 20 – 21 October in Bloemfontein under the theme ‘40 years of struggle and professional service to the marginalised. Where to from here?’ Starting the proceedings of the conference, attorney and representative of the BLA at the National Forum on the Legal Profession (NF), Kathleen Matolo-Dlepu, gave an update on the NF. Ms Matolo-Dlepu said that the NF was established to deliver recommendations for the new regulatory body, namely, the Legal Practice Council (LPC). She noted that the role of the NF is included in s 97 of the Legal Practice Act 28 of 2014 (LPA). 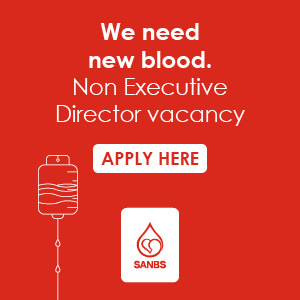 She added that the NF has completed its mandate and submitted its recommendations to the Minister of Justice and Correctional Services, Michael Masutha, on 26 October. LPC cost structure and funding. Ms Matolo-Dlepu said the NF in terms of s 97(2)(a) of the LPA must reach an agreement with the four statutory provincial law societies on transfer of assets, rights, liabilities, obligations and staff to the LPC and PCs, however, she pointed out that an agreement had not yet been reached. Ms Matolo-Dlepu encouraged legal practitioners to read and familiarise themselves with the LPA. ‘LPA National Forum expected in 2015’ (2015 (Jan/Feb) DR 21). ‘First meeting of the National Forum of the Legal Practice Act’ (2015 (May) DR 12). ‘National Forum start shaping the new dispensation’ (2015 (Sep) DR 18). ‘National Forum meets for third time to continue Legal Practice Act work’ (2015 (Nov) DR 16). ‘National Forum on the Legal Profession one year on’ (2016 (March) DR 10). ‘First recommendations emerge from National Forum deliberations’ (2016 (June) DR 22). ‘National Forum to propose separate voters’ for rolls for attorneys and advocates for first Legal Practice Council elections’ (2016 (Oct) DR 17). ‘National Forum races against time to submit recommendations to minister’ (2017 (June) DR 17). ‘National Forum racing against time to submit recommendations to minister’ (2017 (Aug) DR 11). ‘Slow progress to Legal Practice Act dispensation‘ (2017 (Nov) DR 7). High Court Judge of the Gauteng Division in Pretoria, Tati Makgoka, announced the relaunch of the journal the African Law Review. High Court Judge of the Gauteng Division in Pretoria, Tati Makgoka, announced the relaunch of the journal the African Law Review. He said he had pointed out to the BLA that it was time it considered how matters concerning black legal practitioners can be debated and narrated by black legal practitioners themselves. Judge Makgoka said the role of black women is still a cause for concern. He added that black women as legal practitioners and as judicial officers’ still face the same challenges that the generation before them faced. Judge Makgoka pointed out that the relaunching of the African Law Review was at an advanced stage and added that the journal, although it will not have changed much from the past, will have a fresher feel to it. He noted that nothing much will change for the simple reason that nothing much has changed for black legal practitioners. Judge Makgoka said the focus of the journal will be Pan Africanism. He said the journal will also focus on the needs and aspirations of black legal practitioners. Judge Makgoka added that the journal will hopefully have a slot for BLA and BLA student chapter activities. He pointed out that the journal will be a quarterly publication and invited those interested to submit articles for the journal. Judge Makgoka said the first publication of the African Law Review will be a celebratory issue. 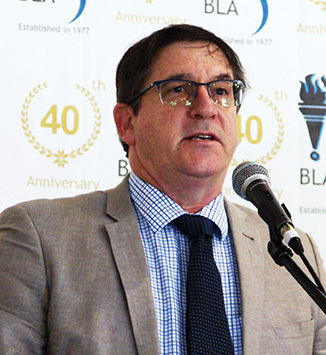 Deputy Minister of Justice and Constitutional Development, John Jeffery, said the BLA’s contribution to the transformation of justice and the transformation of the Bench cannot be underestimated. He pointed out that there are still obstacles that black legal practitioners have to overcome, from finding financial means to study, to finding articles of clerkship and finding means to support themselves. He added that it is not an easy path for student legal practitioners more so for black student legal practitioners. 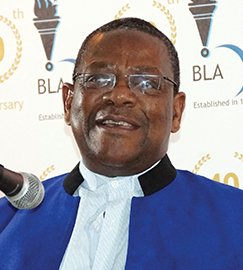 Deputy Minister of Justice and Constitutional Development, John Jeffery, said the Black Lawyers Association’s contribution to the transformation of justice and the transformation of the Bench cannot be underestimated. Mr Jeffery said concerns raised by the BLA, when they marched to the Union Buildings in July, included dissatisfaction with the lack of representation of black legal practitioners and women practitioners in the governments briefing patterns and distribution of legal work. He noted that his department took the concern raised by the BLA very seriously and added that President Jacob Zuma had tasked the Department of Justice to look into the challenges raised by the association (see ‘BLA marches to voice dissatisfaction on legal work distributed by government’ (2017 (Sept) DR 9)). Mr Jeffery pointed out that lack of transformation in the legal profession impacts on briefing patterns. He said as a starting point the legal profession has to be looked into as a whole. Mr Jeffery noted that there are roughly 24 000 practicing attorneys in the country, of which 60% are white and that the advocate profession is even less transformed with 2 800 advocates of which 65% are white, ‘we encourage all arms of the state to prioritise and empower black lawyers, particularly women,’ he said. Mr Jeffery said the legal fraternity is one of the key sectors that is being touted as part of government’s radical, social and economic transformation programme in order to get rid of uneven, unequal, racial and gender representation in the key sectors of the society and in the economy. He pointed out that the Law Society of South Africa hosted a summit on the distribution of work for attorneys and briefing patterns for advocates in 2016 (see ‘LSSA hosts summit on briefing patterns’ (2016 (May) DR 6)). Mr Jeffery added it was after that summit that the Action Group was formed, he said that the Action Group is made up of attorneys, advocates and officials from the justice department. Mr Jeffery noted that the Action Group, obtained the assistance of Judge Presidents of various divisions of the High Courts, to document statistics on legal practitioners who appear in the courts on both civil and criminal matters. He added that Chief Justice Mogoeng Mogoeng expressed his support for the initiative at the Provincial Efficiency Enhancement Committee meeting he chaired. Mr Jeffery said the Action Group drafted Procurement Protocol that has been approved by attorneys and the advocates’ profession and the signing of protocol took place in June in Johannesburg (see ‘Procurement Protocols for the legal profession adopted’ (2017 (June) DR 18) and ‘A historic moment-Action group on Briefing Patterns delivers procurement protocols’ (2017 (Aug) DR 6)). 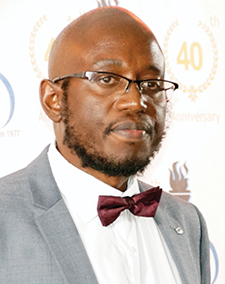 He added that other initiatives that have been taken, such as that of the Johannesburg Bar Council (JBC), where advocates of the Johannesburg bar adopted the resolution that would see members face charges of unprofessional conduct if a team of three or more advocates does not include a black advocate. Mr Jeffery pointed out that the resolution seeks to advance the course of black women facing responsibility amid council to take appropriate steps to ensure that women are identified and given preference. He said the chairperson of the JBC said the legal profession should take the lead in promoting and fulfilling the ideas of the Constitution. He added that in April the Cape Bar Council advised that regular meetings between the legal firms and the Cape Bar Council should be held to meaningfully address the problems of skewed briefing patterns. 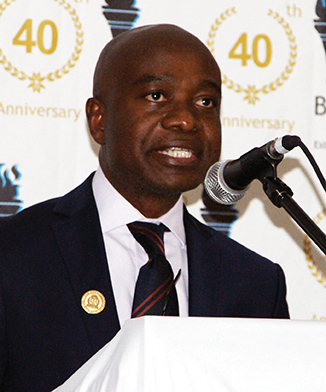 The Black Lawyers Association President, Lutendo Sigogo, spoke at the association’s gala dinner in October. Mr Jeffery said the programme will play a key role in motivating those responsible for briefing patterns and identifying any bias, which stands in the way of equitable briefing patterns. He pointed out that at the end of each financial year, attorney firms will provide data on the number, nature and value of briefs according to race, gender and seniority for the Bar Council. However, Mr Jeffery added that despite the legal profession being overwhelmingly white, 79% of the value of government briefings were paid to previously disadvantaged individuals and of the number of 5 296 government briefs given 4 872 went to previously disadvantaged individuals. Mr Jeffery added statistics for briefs that were given out are uploaded on the Justice Departments’ website for public knowledge. He said if legal practitioners have problems with regards to briefing patterns and if legal practitioners think that certain individuals are being favoured they must let his department know. A question was posed to Mr Jeffery regarding the appointments of acting magistrates. Acting Magistrate, Ruth Ncwane, told Mr Jeffery that she was told to submit a report in respect of her position as an acting magistrate, on why she should be kept in the position. She asked why the Justice Department did not keep acting magistrates for more than two years. Mr Jeffery responded by saying that when he took office, he found that some acting magistrates had been acting for years, some for 12 to 15 years. He said the process of appointing an acting magistrate was not a thorough one, because if a legal practitioner wanted to become an acting magistrate, they go to the magistrate of that area and request for space to become an acting magistrate. He pointed out that the department cannot have a situation where one can act as an acting magistrate indefinitely. 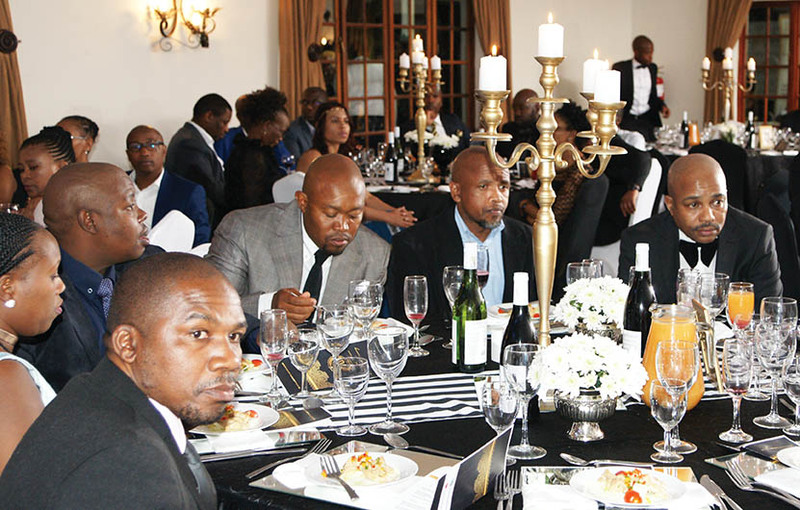 Chairperson of Black Business Council, Sello Resethaba, delivered the keynote address at the Black Lawyers Association’s gala dinner in Bloemfontein. Mr Jeffery added that the idea of an acting magistrate is to give legal practitioners an opportunity to experience the Bench and added that two years as an acting magistrate is a rough guide. He noted that he had spoken to some chief magistrates and some were keen on indefinite appointments, but added that he asked why, after two years, the person acting as a magistrate did not apply for a position and if they applied why did they not get accepted in the permanent position? Mr Jeffery said there have been situations where acting magistrates have applied for permanent posts and gone to the magistrate commission. He noted that the commission had found that the person was not suitable. He added that some acting magistrates do not apply at all because they know that they will not get the job. Delegates attending the Black Lawyers Association’s 40th Anniversary Dinner. On the evening proceeding the AGM, the BLA held their 40th Anniversary Gala Dinner and Awards Ceremony. Chairperson of Black Business Council, Sello Rasethaba, delivered the keynote address. Black Lawyers Association members toasting before cutting of the cake at the association’s gala dinner. 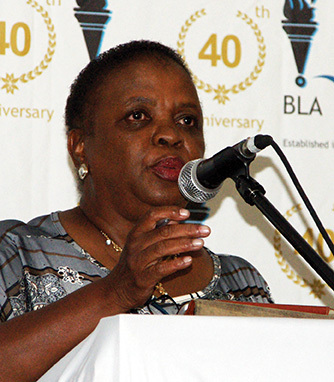 President of the BLA, Lutendo Sigogo, asked: ‘What are we celebrating when we celebrate 40 years of the BLA? When I reflect on what we are celebrating, I see a few things, but the chief amongst them, I see the role the BLA played to unify our black people, particularly black legal practitioners. It is through the efforts of the BLA that we do not see each other in terms of our tribes, we do not see each other in terms of ethnicity, where we come from, … whether we differ in terms of religion we still relate very well as members of the BLA. BLA makes us South Africans; it is indeed that when we are in BLA we see past our origin. When we see Alfred Mangena in the video that we just saw, we are reminded of the pain he went through, he was refused permission to be admitted as attorneys by the Law Society of the Transvaal and had to go to court in order to win that matter. From that day onwards until today, we are all allowed to practice law, to be admitted as attorneys or advocates and we no longer go through that battle, which Alfred Mangena had to. So we see this as strength when the two first black attorneys [Mr Mangena and Pixley ka Isaka Seme] had to come together and form a legal practice. … We have seen that when they were practicing on their own, they faced several challenges but when our leaders like Godfrey Pitje came together with other black lawyers and formed the BLA in 1977, they put to rest the challenges that were facing those lawyers who came before them. Toast at the Black Lawyers Association’s 40th Anniversary Dinner. A statement rereleased by BLA stated that at the close of the AGM the meeting resolved to adjourn the election of the National Executive Committee (NEC) for a period not exceeding three months from the date of the AGM. The adjournment of the election was necessitated by a technical glitch, which caused a delay in the production of election materials such as ballot papers. The statement went on further to state that the BLA is known for its steadfastness in observing the law and its internal rules. Since its inception the BLA consistently held elections of the NEC and Branch Executive Council (BEC), biennially, in accordance with the provisions of its Constitution. The statement added that the BLA prides itself for respecting its democratic processes through periodical election of its leadership. The NEC will, in line with the AGM’s mandate, reconvene the AGM for the purpose of conducting elections. Members of the BLA will, in due course, be advised of the date and venue of the continuation of the AGM. Kgomotso Ramotsho Cert Journ (Boston) Cert Photography (Vega) is the news reporter at De Rebus and Mapula Sedutla NDip Journ (DUT) BTech (Journ) (TUT) is the editor of De Rebus. This article was first published in De Rebus in 2017 (Dec) DR 10.